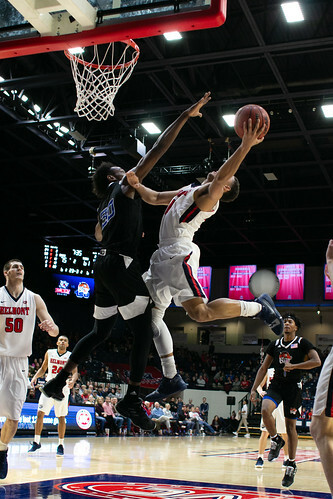 The Belmont men’s basketball smoked Tennessee State University 92-74 on Saturday night, with senior Dylan Windler dropping 25 points and shooting 7-8 from the 3-point line. Windler came into the game ready to go, after only scoring 14 in Thursday’s loss to Jacksonville State. TSU was led by former Belmont basketball star and current Tigers head coach Brian Collins. Collins was a member of the 2005-2006 team that brought Belmont to its first ever NCAA Tournament. The Tigers kept it a close game throughout the first half, only trailing by 4 with six minutes to go in the first half. But it wasn’t enough to keep the Bruins from playing one of their best games all season. The Bruins went into halftime with a confident lead of 43-31. In the second half, Belmont ran away with the game and never looked back, as players like Windler and freshman Nick Muszynski proved to be some of the best athletes on the court. Belmont played a great defensive game, scoring 22 points off of turnovers. Muszynski had three blocks, two of which were back to back. Muszynski also came in clutch on offense once again, scoring 23 points, rebounding six and assisting five. The freshman center also had a monster dunk in the second half that brought fans to their feet. Freshman Grayson Murphy had one of his best performances of Belmont’s past few games, scoring 12 points and grabbing four rebounds and two steals. Senior Kevin McClain, who has evolved into one of the biggest impact players for the Bruins, scored 16 points and got four assists. The Bruins will hit the road for their next two games. On Thursday, Belmont will face the undefeated Murray State, led by top NBA draft prospect and viral sensation Ja Morant, who is currently averaging 23.3 points a game, 6.1 rebounds and 10.6. Photos by Carina Eudy and Samantha McCall.